Interest rates are on the rise, spooking investors who fear the trend will make the economy sluggish and increase costs for companies. But several exchange-traded funds (ETFs) thrive when interest rates rise, giving investors an option in this tougher market environment, if history is any indication. CNBC used analytics tool Kensho to determine the best-performing ETFs when the 10-year Treasury note yield rises 25 basis points or more over a span of 30 days. There have been 18 instances of such a rate move happening since 2008. Last week alone, the 10-year yield rose about 18 basis points to above 3.2 percent. Shares in the VanEck Vectors Oil Services ETF saw a 6.5 percent boost over the month when rates jumped, while shares of the United States Oil Fund ETF ran up 4.5 percent, acccording to Kensho. The SPDR S&P Regional Banking ETF is also a top-performer, surging 4.9 percent. Strong economic data and comments on U.S. monetary policy from the chairman of the Federal Reserve were a boon to interest rates last week. The 10-year U.S. note yield jumped as unemployment continues to drop, the U.S. services sector is expanding rapidly and Fed Chairman Jerome Powell said the central bank is “a long way” from getting interest rates to neutral. Combined, all these factors led the benchmark 10-year U.S. note yield to jump near its highest levels in more than seven years. 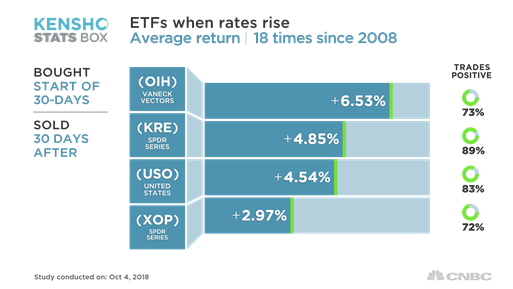 But not all ETFs see the same historical success in a rising interest rate environment. The United States Natural Gas Fund falls 5.4 percent on average during 30-day periods of rising rates, according to Kensho. 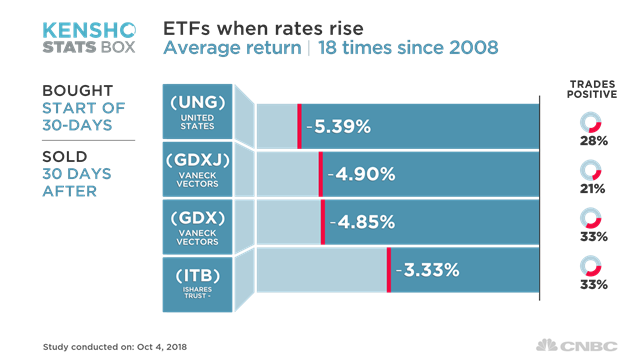 Two gold-focused ETFs – VanEck Vectors Junior Gold Miners and VanEck Vectors Gold Miners – also under perform for the following 30 days, each down 4.9 percent on average. – CNBC’s Fred Imbert contributed to this report.